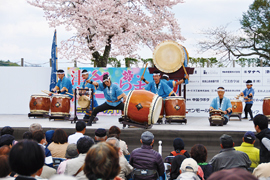 Here we introduce the traditional festivals and other main events that are held throughout the year in Tsuyama City. Tsuyama Castle (Kakuzan Park) / April 1 to 15 Tea ceremonies, etc. 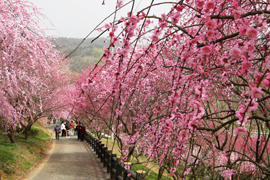 are held below the approximately 1,000 cherry blossom trees in the park which was selected for inclusion in “Japan's Top 100 Cherry Blossom Viewing Sites”. The park is open until 10:00 pm during the festival. Sakura Shrine / 2nd Sunday in April Dedications to martial arts, etc. 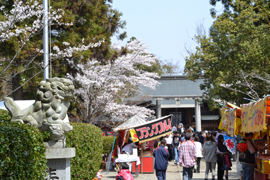 are performed in the approximately 33,000 m2 grounds of this shrine which was built in the 17th century. Nakayama Shrine / April 29 Praying for a good harvest, the dancers dressed as farmers carrying hoes perform an entertaining enactment of the planting of rice in sync with the Japanese drums and flutes. Seigenji Temple / late April to early May Also known as the “Peony Temple”, a total of 300 peonies including about 100 types can be seen blooming together. Aba / 4th Sunday in May There are many events such as special and demonstration sales of yama-udo (mountain asparagus) and bracken, etc. Banks of the Yoshii-gawa River / 1st Saturday/Sunday in August The Summer Festival is held every year on the first Saturday and Sunday in August. 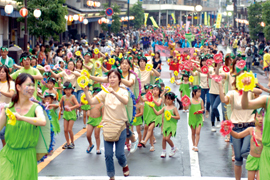 “Gongo” is the Tsuyama region dialect for “Kappa” (a mythical water-dwelling creature), and this is a seasonal tradition with the theme of “reviving the river spirit”. Several thousand people attend the Gongo dance and impressive fireworks display. Shiode Pond / August 12 The finale to the Summer Festival, which includes various stage events, is the fireworks display which colorfully lights up Shiode Pond. 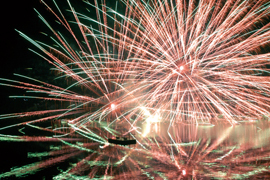 It is well worth watching this fireworks display which is a rare event in the north of the prefecture and covers the water surface with a magical atmosphere. 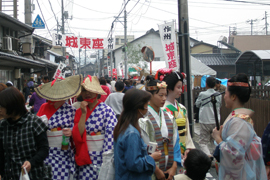 Josai District / early October The fair is held with “exchange and information through handiwork” as the theme so that you can rediscover the traditional handiwork and townscape. Takata Shrine / 2nd Sunday in October The parishioners of the Takata District give a lion dance performance which is rare anywhere in Japan. 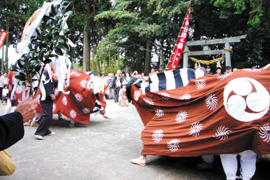 It is registered as an important intangible folk culture asset in Okayama Prefecture. Osumi Shrine, Takano Shrine, Tokumori Shrine / 3rd/4th Sunday in October A fall festival which is one of Japan’s “Three Great Mikoshi (portable shrines)” and where the large mikoshi of Tokumori Shrine is paraded with the floats which are designated as cultural assets by the prefecture. 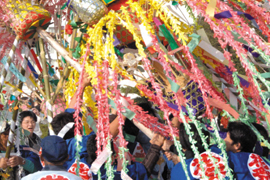 Shohoku / November 3 This is one of the “Sakushu Three Major Festivals” and an important intangible folk culture asset of Okayama Prefecture. 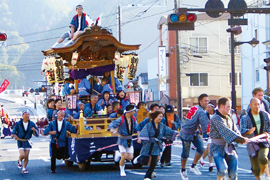 This is a festival with Hachiman Shrine as the parent deity and the parishioners of the surrounding shrines getting together to carry the mikoshi and pray for a good fall harvest. 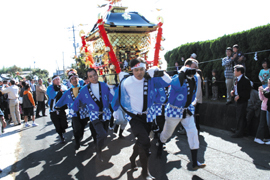 Aba / November 3 The Aba Hachiman Shrine Fall Festival is called the “Flower Festival” and is an important intangible folk culture asset of Okayama Prefecture which is famous as a dynamic festival. 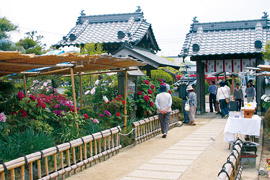 A flower festival is also held at the Monomi Shrine in Kamo on the 4th Sunday in October. Joto District / 1st Sunday in November Along the Old Izumo Highway are old-fashioned playhouses and stalls, and there are many people dressed up as samurai and merchants. 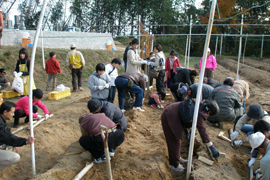 Late November There are many attractions such as the autumn leaves and local cuisine, the Mimasaka-no-kuni tea ceremony and flower arranging meeting, and the modern art. Roadside Station “Kume-no-Sato”, Tsuyama Wild Yam Producers’ Association Sorting and Shipping Center/ early December An event for selling the wild yams which are a specialty of Tsuyama. 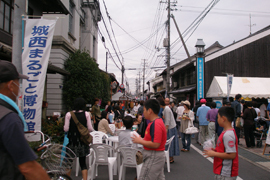 This is held at the Roadside Station “Kume-no-Sato”. 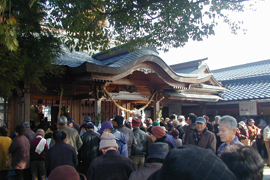 Fukurikiko Shrine / January 1 to 3 of lunar calendar A major festival at a shrine which has maintained a strong following of those that believe it is effective in protecting people from pit vipers and ensuring the safe birth of children. It attracts a great number of worshipers. 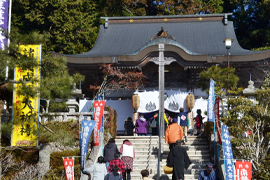 Manpukuji Temple / last Friday/Saturday/Sunday in February It is said that visiting the shrine on this day imparts power, good fortune and wisdom to the 13-year old children, and is attended by many worshippers from the area. Early March The “Tsuyama Castle Town Hina Dolls Tour” is where Hina dolls are displayed in all the stores in the center of Tsuyama. 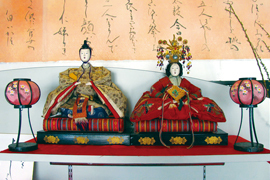 Valuable dolls that have been handed down from the old families in the castle town are displayed. Ume-no-Sato Park / early March In addition to being able to enjoy the 2,000 red and white plum trees, there are various events and plum products are sold. The events are subject to changes or cancellation. Also, the best times to visit the sights may change depending on the weather.